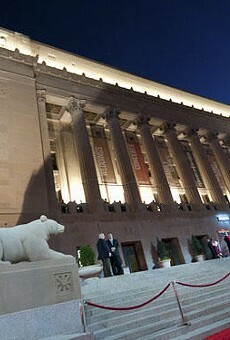 Jason Stoff The Peabody Opera House on the night of its grand opening. 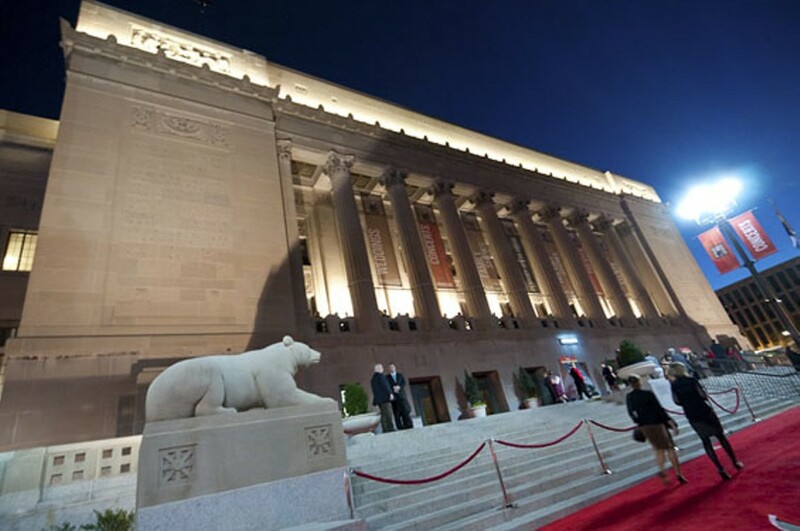 This week the Peabody Opera House, a historic monument to St. Louis' great gilded entertainment past, opened with performances by Tonight Show host Jay Leno and soul legend Aretha Franklin. And Tuesday, Wilco played to a sold-out crowd at the posh venue that's been dormant since 1991. That wasn't Wilco's original plan. The show was originally planned for the Pageant, but the newly remodeled venue in the band's original stamping grounds proved a better fit. The move set off some initial pondering as to where the Peabody fits within St. Louis' existing music venue infrastructure. Questions rose about whether the Peabody would soon begin picking off shows from other similarly sized venues. Wilco's publicist Deb Bernardini says it's "not really an 'instead of' situation. The band tries to play different venues in each and every market; it keeps it interesting for themselves and for their fans." "It's nice, kind of high-end middle-ground venue," says John Cattanach, managing director of the Touhill Performing Arts Center at the University of Missouri-St. Louis. "The right show will find the right venue, and it's more opportunity to get artists and more entertainers in the St. Louis area." 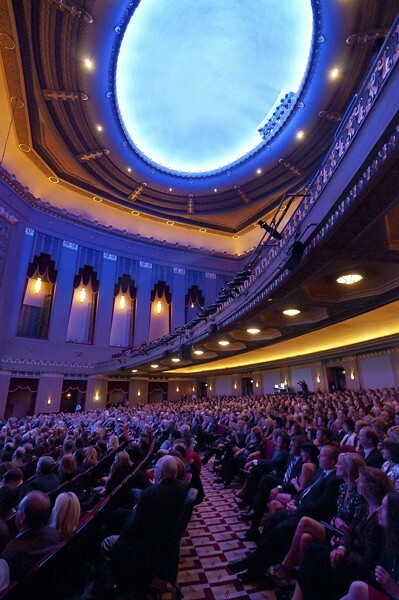 From a purely seating capacity standpoint, the Peabody fits roughly 3,000 attendees, putting it between the Fox Theatre's 4,000 and the Pageant's 2,500. The Touhill seats about 1,600. Many promoters and club owners agree that if the Peabody has any effect on a specific venue, it will likely be the Pageant. Patrick Hagin, a co-owner of the Pageant, is still promoting the Wilco show at the Peabody owing to his long relationship with the band. During its last visit to the city, Wilco played three sold-out nights at his venue. But promoting is also the other part of Hagin's job. This was a chance for the band to do something different, he says. "I'm not bitter about it, and I want to work with the Peabody," Hagin says. "I'm not going to say it will make my life easier. I would like to think that there is enough room in this city. I'll lose the occasional show, but as a promoter it will be good from that end of the business." As in Wilco's case, Hagin says it has just as much to do with the experience the bands are looking for or what is more in keeping with either venue's image. Social Distortion will play the Pageant, but the closest the Peabody will get to a raucous punk-rock show will be the Green Day musical American Idiot. "From the outside perspective, I think it's a great thing for the city," says long-time St. Louis promoter Mike Judy. "It's another great venue, and it's going to be able to bring some of those in-between shows that are too large for the Pageant and might not be appropriate for the Fox. The Fox doesn't do a ton of shows like that anyway, so it's really something that's going to affect the Pageant the most." Rich Baker, president of Fox Associates, the company that owns and operates the theater, says it would not comment on how the Peabody might affect bookings at the Fox. The organization only offered a prepared statement that it looked forward to the continued renovation of Grand Center and St. Louis' arts and entertainment district. John Urban, the Peabody's executive vice president of events and new business, says that the Peabody's role is not to step on the toes of any other St. Louis venues. He wants to recapture the reputation and the glory of a venue that was one a must-play destination for some of the biggest names in entertainment. "The Peabody gives acts and the city a piece that was probably missing in the puzzle," Urban says. "Wilco is a great example of being a band that's played a lot of different rooms in the city. Maybe bands that have come through St. Louis and played the Pageant will see the Peabody as someplace else to play." The Kiel Opera House opened in 1934 and functioned until 1991, when the neighboring Kiel Auditorium was demolished to make way for the Scottrade Center, which now plays host to the St. Louis Blues and other large stadium concert events. In its time the Kiel Opera House played host to luminaries such as the Rat Pack, Bob Hope and, during the 1970s and 1980s, musical acts such as Bruce Springsteen, Peter Gabriel and the Rolling Stones. In May 1991, the St. Louis Philharmonic played the final event at the opera house, and the space has been dormant ever since. Public and private financing plans came together in 2009, when the city's board of aldermen voted to finance $29 million of the $74-million redevelopment plan for the opera house, now called the Peabody. "It's a seated theater environment designed for a lot of different events," Urban says. "I think there are bands who can sell 3,000 seats in St. Louis who can't sell 4,000. Besides, the Peabody still resonates in the music industry. The sight lines, the great sound, all of that has been brought back to life." The Peabody hired Adrian Silverstein away from his job as a member of the Pageant's production team. He's now the production manager at the opera house. The move came with no ill will and was a good career move for Silverstein, Hagin says. Mike Cracchiolo, owner of the Firebird, has been producing shows in the St. Louis area for years. He says the perception of competition is a bit overplayed and believes that there will be enough programming and enough diversity between the needs of the different venues to find acts to fill the seats. "As far as programming is concerned, they are only going to be able to do what is going to fill that room," Cracchiolo says. "It doesn't have a lot to do with what we do, but it has a lot to do with what the Pageant does and what the Fox does. It might take stuff that's a little too big for the Pageant, but the Pageant can do anyway. If there's competition, it's something the public will never see." The Peabody isn't the only new player entering the St. Louis live-music market this fall: By mid-November, Plush, a venue and restaurant with an 800-person capacity, is expected to open. There hasn't been a space of that general size since Mississippi Nights closed in 2007. Plush owner Maebelle Reed says that competition will ultimately help the music scene. "There were a certain number of bands that were bypassing St. Louis because the venue sizes were not right," Reed says. "We're a capitalist society, and we've shown that competition is a good thing. There's going to be a grudge and weirdness at first, but ultimately competition is a good thing, especially in a market this size." Hagin says that much of the excitement surrounding the Peabody, from a rock-music perspective, is rooted in the acts it drew during its more raucous heyday. Whether it thrives or not depends on if the shows are good and the interest carries on beyond the initial grand reopening hoopla.